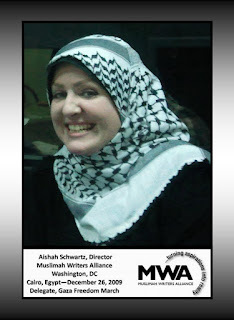 WASHINGTON, D.C. (MWANET) Jan. 30, 2010 - Muslimah Writers Alliance Director, Aishah Schwartz, has been extended an honorary invitation to attend the February 11-13, 2010 Bridges Foundation workshop, 'Objective Thinking' in Cairo, Egypt. 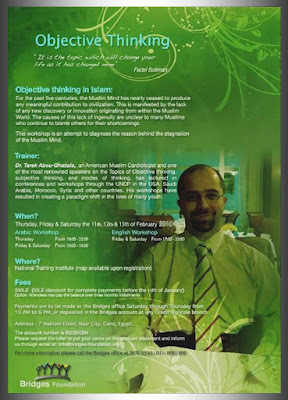 The 'Objective Thinking' workshop to be presented by Dr. Tarek Abou Ghazala, Founder and Chairman of The Circle for intellectual Revival of Concept Learning and Education. The Circle is an intellectual organization dedicated to producing a moderate Muslim mind that can reason using objective or value thinking. 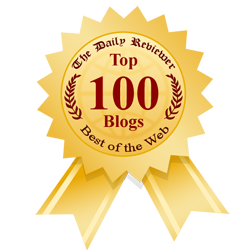 It's work is based on the Quran, the Sunnah and the scientific foundation of the early Islamic scholarly work. His workshops have been presented at Universities, Intellectual Institutions, National Libraries and Think Tanks in locations such as Syria, Morocco and the American University in Washington, D.C. The primary target audience intended to benefit from training received through the 'Objective Thinking' workshop, is the Muslim Youth community, who represent the fresh hope that the Muslim community at-large will awaken from its mental stagnation. The workshop is offered in both Arabic (Feb. 11, 12 & 13) and English (Feb. 12 & 13).